Flying into Pittsburgh, I was anxiously anticipating what experiences I might find ahead of me. How will I converse with these holy sisters in Christ? How will I open my eyes to see and my heart to accept the eternal lessons that might lie ahead? I had several reasons to visit the Orthodox Monastery of the Transfiguration. I had hoped to find my dear friend and former All Saints member, novice Sister Mary, acclimated to and comfortable with the monastic life she had recently chosen. I wanted to interview some of the nuns to gain a deeper understanding of their lives and write about them. And I desperately needed a “peaceful rest for my soul, away from the busy-ness of the world” as I had read in the monastery brochure. and a time to experience God’s presence and guidance. We hope that you will plan to visit us. Driving with Sister Mary into Ellwood City, 30 miles northwest of Pittsburgh, I saw a small town reminiscent of other small Pennsylvania towns with which I was familiar. As we drove along some winding two-lane roads, I marveled at the green, lush foliage and lovely spring flowers — dogwoods, lilies of the valley, and luscious lilacs. They brought back many fond memories of living in Western Maryland as a young girl. Already my soul was being refreshed! (Hebrews 12:1). As I soaked in the holy space, it felt as if layer upon layer of accumulated weight fell away. I was feeling lighter. Simply standing in the presence of Our Risen Lord, His blessed Mother and all the saints was awesome beyond words. Of particular importance in the narthex was the Healing Corner. Housed in this corner are icons of saints who have been known to heal, various oils, prayers, and lists of dear ones suffering from assorted ailments. I felt compelled to visit that corner often during my stay and pray for family and friends who are suffering. Another very powerful point of interest in the narthex was the reliquary where relics of many saints have been housed and venerated. This has been a great source of blessing and comfort for the monastics as well as for visiting pilgrims. Dining in the refractory with the Mothers, Sisters and guests, we sensed our oneness in Christ as together we sang, “Christ is risen from the dead, trampling down death by death”. Abbess Mother Christophora blessed the food, invited us to take our seats, and encouraged us to enjoy our lunch together. Though a fasting day, Mother Galina whipped up a fabulously tasty Chinese dish. A unique situation occurred on Saturday night. Fr. Thomas Hopko who typically serves the Vigil was out of town. Therefore, the nuns just kept joyfully singing the Paschal celebration. 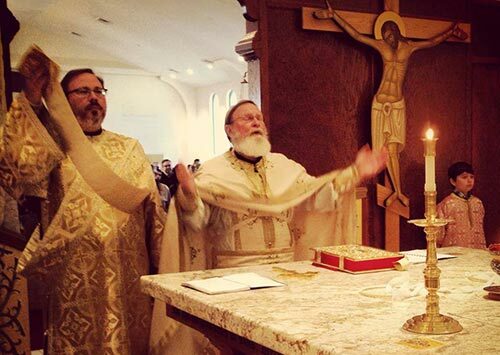 It felt like Pascha Sunday all over again! Wanting to stay in the moment, I took in the sights of beautiful flowers adorning the icons, the sounds of angelic voices, the smell of incense wafting as Sister Martha passed by with the incenser. Sunday Liturgy felt like and sounded like worship in our parish. I felt like I was at home with family. I noticed as guests arrived, Mother Christophora noted who they were and later sang the Paschal hymn in their language. I felt sure those guests felt at home, too. Thank God, I got up early on Monday morning at 6:30 am to pray Matins and the Hours. Most guests had left for home so it was very quiet. Such a peaceful time of prayer, a great parting memory for my return to Raleigh! As I drove away from the beautifully serene grounds, renewed in body and soul, I prayed I would carry the spirit of this holy place in my heart and share it with others. All of the Mothers and sisters have obediences (or duties) that they must perform throughout the day. It’s hard work keeping the monastery running smoothly — tending the beautiful gardens, maintaining the bookstore, preparing the meals, doing the dishes, keeping up with the paperwork, just to name a few tasks. While all the nuns perform their assigned obediences as part of their worship life, their lives are punctuated with corporate morning and evening prayers. In addition, each has her own personal prayer rule. These prayers are prayed in their individual cells. Although praying daily for the world is their primary ministry, their second essential ministry is hospitality. Food and shelter for the body, comfort and prayers for the soul are provided for visiting pilgrims, both orthodox and non-orthodox. The annual pilgrimage on their feast day, August 6, brings hundreds to celebrate. Yet the one needy soul who shows up at the door is warmly greeted, as well. Man is made in the image and likeness of God and is capable of knowing God, even being like God through grace. We can come to know life beyond daily experience of material things. We can know we have eternal life, which begins here on earth. We can be in communion with God every moment of our lives–in every detail of life, of our responsibilities, our relationships with others, every task we do whether at work, at home or in church. We can feel God’s presence with us at all times and in every place. We can learn to speak to Him on the altar of our hearts, whether alone or with others. God is real. He reveals Himself to us, and He wants us to know Him. Knowing Him is different from knowing about him. We can learn about God by reading books; but we come to know Him through prayer, silence, and through relationships with others, through nature, art and beauty… even through noise, especially of children. We are members of Christ. St. Paul says the Church is the Body of Christ, and we all are members with different responsibilities. Each responsibility is important and needed and is not to be neglected. Some are called to serve in church, even in the altar, while others sing or read during the divine services. Yet they are not the only ones that make up the church, nor should they be considered more important than the other members. All of us gather together to serve the Holy Liturgy–the old, the young, the infirmed, the healthy — everyone serves the Liturgy together. In the Orthodox Church the priest is not allowed to serve the Liturgy alone with no one else in church. Besides serving the Liturgy all members, also, have to care for the material side of the church. When Jesus Christ, Son of God, took on human flesh, He saved our life in the world and all material things. He blessed His Church, His body, to encompass material aspects so all care of the physical structure of the church, and its social extensions, are blessed by Christ. So if we clean the church or the parish hall, empty the trash, order the candles, make the coffee, teach a Sunday school class—all are part of serving the Liturgy. Even our personal preparation of prayers on Saturday and Sunday, choosing clothing, polishing our shoes — all are part of the Liturgy. Want to Visit the Monastery? 3. When you call, ask to speak with Mother Barbara. She keeps the guest schedule and will know what’s available. 4. If you plan to fly, Pittsburgh is your destination. Ask Mother Barbara if there is anyone available to pick you up at the airport. 5. While there is no fee to stay in the guesthouses, a donation is acceptable. 6. You are not required to attend all the services that are available, though you will want to attend at least some. 7. There is no special dress code. You may dress comfortably, yet modestly. 8. If you want to take a gift, the nuns enjoy sweets!